Leah Hogsten | The Salt Lake Tribune Timpview High School junior Jackson Cravens (#94) is the nephew of Kyle and Cary Whittingham and the cousin of Washington Redskins linebacker Su'a Cravens. He has expectations attached to his name, and after switching from linebacker to defensive tackle following a growth spurt, he's beginning to meet his athletic promise. Sept. 10, 2016. The Utah football team addressed a major need in a big way on part two of National Signing Day, led by the addition of wide receiver Solomon Enis from Arizona and a bevy of players along the defensive front. The 6-foot-3 Enis, a four-star prospect and son of former Penn State running back Curtis Enis, picked the Utes over Penn State, USC and Arizona State. Enis provides a huge lift to a wide receiver group that loses All-Pac-12 selection Darren Carrington II to graduation and Raelon Singleton as a graduate transfer. The Utes’ class now includes both a four-star quarterback in Jack Tuttle, who signed in December, as well as a four-star wide receiver viewed as one of the top pass catchers in the nation. A Phoenix resident, Enis gained 1,670 all-purpose yards as a senior, including 46 catches for 820 yards and eight touchdowns. The Utes announced 14 signings on Wednesday on top of seven from the early period. That does not include a trio of commitments who will go on LDS Church missions that NCAA rules prevent the Utes from speaking about publicly. Rivals and 247Sports ranked the Utes recruiting class as sixth-best in the Pac-12, while 247Sports ranked the class 38th nationally. Utes recruiting coordinator Fred Whittingham Jr. said earlier this week that Tuttle’s signing served as a benchmark for the program. Along with Enis and Tuttle, the Utes signed wide receiver Terrell Perriman out of Miami during the early signing period. They also added three players projected to play tight end on Wednesday; the Utes actually started signing day on Tuesday afternoon when Australian rugby player Thomas Yassmin, a projected tight end, signed. The Utes also signed a record-setting running back from Louisiana in Covington High School’s Devin Brumfield. A three-time all-state running back, Brumfield rushed for 2,307 yards and 25 touchdowns as a senior. He set school career records for carries, yards and touchdowns and finished his prep career with more than 6,000 rushing yards and 70 touchdowns. The Utes add Brumfield to a running back group that includes returning starter and 1,000-yard back Zack Moss as well as Armand Shyne, who redshirted last season due to injury, and Devonta’e Henry-Cole. Freshman TJ Green sat out last season as a redshirt. The Utes also added former Utah prep standout Sione Lund as a transfer from Stanford, but Lund will move to linebacker. Brant Kuithe, who signed along with his twin brother out of Katy, Texas, played running back in high school. He’ll come in as a tight end and could line up as a fullback in certain sets. The Utes also reinforced a defensive front that loses three starters in Filipo Mokofisi, Lowell Lotulelei and Kylie Fitts. The Utes must also replace a pair of starting linebackers in Kavika Luafatasaga and Sunia Tauteoli. “I think we’ve got a group of guys in that defensive class — there was 14 overall on defense — that we signed, and you’ll probably see close to half of those guys be contributors this fall,” Kyle Whittingham said. Timpview defensive lineman Jackson Cravens, East High defensive lineman Paul Maile, East High defensive lineman Tennessee Pututau, Herriman defensive lineman David Fotu, Herriman offensive lineman Jaren Kump and Highland offensive lineman Hunter Lotulelei have each signed with the Utes. Lotulelei, Pututau and Kump will serve LDS Church missions before enrolling along with Pleasant Grove defensive end Jonny Fanaika, who also announced his commitment on Wednesday. Cravens, the 11th-best prospect in the state and the top defensive tackle prospect according to 247Sports, announced his commitment this past weekend. Maile has been rated as the state’s 12th-best prospect and second-best defensive tackle prospect behind Cravens. Both 247Sports and Rivals rate him as a three-star prospect. 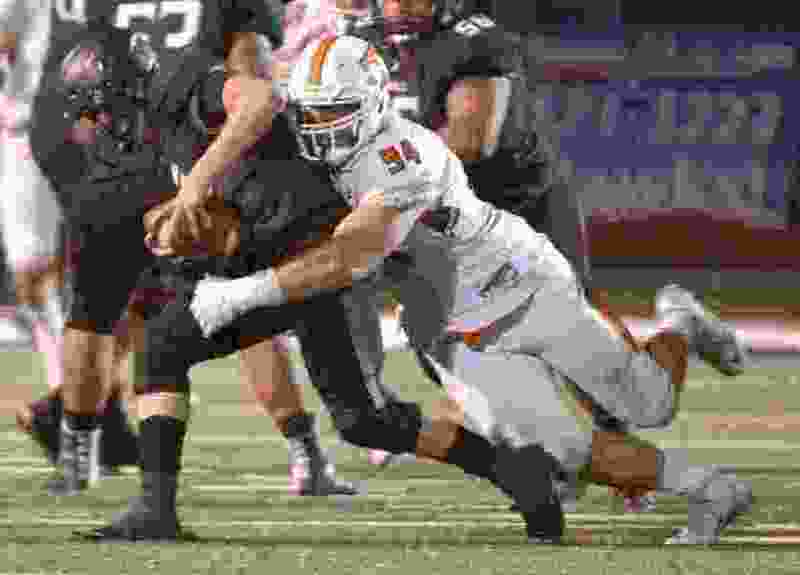 Four incoming recruits are coming off missions, including 6-foot-7, 255-pound defensive lineman Simi Moala, who originally committed to Oregon State when current Utes associate head coach Gary Andersen was at the helm of the program. Cole Fotheringham, tight end, 6-4, 235, San Clemente, San Clemente, Calif.
Simi Moala, defensive lineman, 6-7, 255, Hawthorne, Calif.
*Kump, Pututau and Fanaika each announced their decisions on Wednesday, but the Utes are not allowed to announce them as part of the class.